Vélo Vogue: Bike Share Demo in Golden Gate Park This Sunday! As experts in sharing modes of transportation, you are invited to check out a fun way to get around this Sunday in Golden Gate Park. The SFMTA and City CarShare, in partnership with BIXI of Montreal, are bringing a Bicycle Sharing Equipment Demonstration to San Francisco! Test ride the bikes on car-free JFK drive and learn more about this exciting new mode of urban transportation. Through this demonstration project, City CarShare hopes to encourage awareness and increased civic conversation about Bike Sharing for San Francisco. 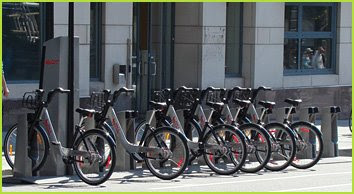 Does bike sharing have the potential to build a greener city while encouraging healthy living? Come and see and tell us what you think. Look for the City CarShare tent in Golden Gate Park just inside the Car-Free Sunday road closure on John F. Kennedy Drive at Conservatory Drive East Sunday, August 2 from 10 a.m. to 3:30 p.m. I know! It'll be a great Sunday in the Park! I hope we an actually launch a program worth having. Our track record for logic based cycling stuff is a little thin in SF these days. Are these some ridiculous $3000 boat anchors like they've been putting in Paris? Because if SF pays 3 grand for bikes they better be carbon and have shiny part that say Dura Ace.